Bill Moggridge wrote a book… and he’s giving it away for free. A couple weeks ago, I attended a lecture by Mr. Bill Moggridge, Director of the National Design Museum. It was an interesting albeit short lecture on what he finds interesting about curatorial design, as well as how the Design Museum looks to keep up with the trends of participatory and accessible exhibits. He currently has a new media committee trying to make the museum more available online. He has also written a book titled ” Designing Interactions” which highlights the different ways that artists and designers have been creating interactive and participatory technology. There are interview videos and biographies for each of the interviewed artists both online and on a DVD included in the book. Better still, he has offered this book FREE for download, either by chapter or in its entirety. Participatory Museum or Playground? Or Both? After our trip to the Met’s Luce Center to try out their technology prototypes, I was struck by one of the comments made– namely, that a young child using the computers in the period rooms was able to exit the program in order to use Paint to draw her name on the desktop. It’s sort of a delightful anecdote and a commentary on the best laid plans of adults often going awry, but it got me thinking about my experiences with museums as a child. 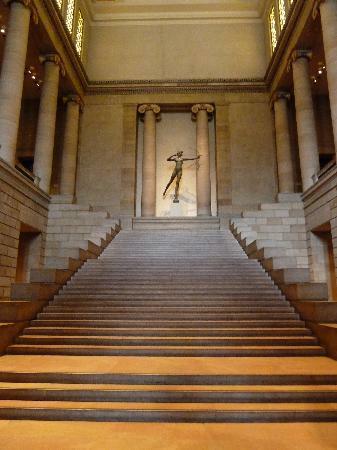 My first memory of visiting a museum is pretty hazy, but it was definitely to visit the Please Touch Museum in Philadelphia (now housed in the fabulous Memorial Hall from the 1875 Centennial International Exhibition), and I was excited because I was allowed to dress up in “pilgrim” clothes and play pretend Thanksgiving with my siblings and other random kids. It didn’t dawn on me until years later what the museum’s mission actually was, because it seemed light on traditional objects and heavy on being a child’s dream playground. They have constantly changing exhibits which are interactive for both children and adults, and currently they have something to do with literature (Alice in Wonderland), physics (a flight exhibit), and nature (a river exhibit). The emphasis, as cued by the institution’s name, is of course placed on touch and learning by doing– something that seems to be a popular trend in science centers too, like we’ve discussed in class. The point I want to make here is, that visiting the Please Touch (which my 5-year-old self called “Policetudge”–all one word), was memorable not because of what I might have learned about the Pilgrims, but because I could touch literally everything there. To an extent I still hold that obsession of wanting to touch museum objects– there’s something about feeling the surface nuances and the weight and solidity of an object that makes me feel as though I understand it more fully. That said, I’m wondering how to classify the Please Touch Museum… now it feels more like a learning center or discovery center than my traditional concept of a museum (another bias leftover from childhood: my points of comparison were the more traditional style PMA and the Barnes Foundation where touching is, obviously, prohibited). As we see with the Luce Center’s more intuitive study computers, there is definitely a rise in more entertaining and accessible technology or interactive features in museum exhibition design. The Please Touch concept is just a simpler version of this type of interaction. I guess the answer to Steven Conn’s question “Do museums still need objects?” could start to get its answer here. Apparently, they need more toys. I had to spend pretty much all of my time in lectures and in the glass galleries though, and was really intrigued by the layout of the exposed study collection. The vitrine case-exhibition style is essentially the same as the regular gallery, just more packed (and sometimes equally packed!) with objects. Sure, there are only accession numbers for this segment of the museum (with unfortunately no visible console or book for looking them up), but other than that there was sometimes very little difference between the study collection and the displayed collection. The shelves for the display collection itself often went up over my head in the 20th century modern section (and I’m not really short, so this was a weird problem to be having). I had to resort to taking wobbly pictures, arms fully outstretched over my head and just hope it would get the right angle since I couldn’t see it. This is kind of a disaster when your formal analysis topic is on the top shelf, but I imagine it’s not the best for the casual visitor either. 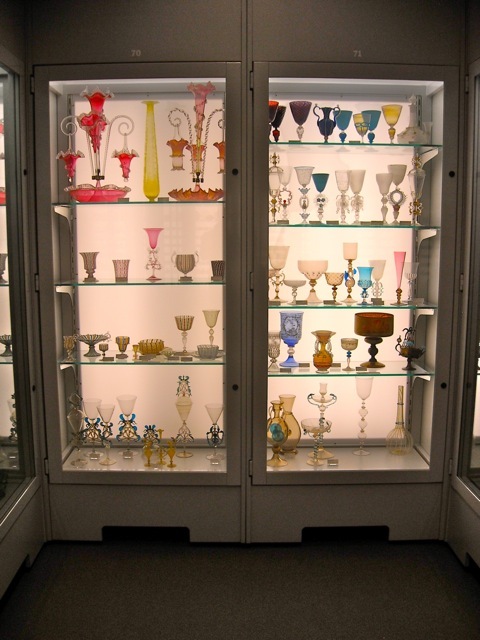 All that aside, Corning has an impressive, large collection, and even with the presence of the study collection, most of their objects are still stored in an offsite facility near the airport. I’m not sure if the study collection rotates different objects, but given the breadth of the collection (and it grows every year! ), it makes me wonder: how feasible is it for large and growing institutions like the Corning Museum to incorporate these aspects of back of house fully into the front of house? When I went to the Hall of Fame most recently, I was with a friend who had never visited and gushed over how personal and intimate the Hall of Fame was, the warm lighting, the display boxes made to feel like lockers and dug outs really indulged a baseball fan’s nostalgia. Upon entry, everything was re-done, what used to be rows of cluttered lockers were now modern display cases with gallery lighting. Objects, much fewer and isolated, seemed detached and inaccessible behind glass panes framed by dry wall painted in deep solid hues. The warmth, accessibility, and feeling of discovery were gone and I felt that kids passing through the halls were really missing out on a connection that I made when I first had visited. I’m curious to know why the Hall of Fame made the move from the dusty charm of its old displays to the sterile and impersonal. I was surprised to see that even the Statistics Room, which used to have old score board-style listings of players’ names and stat numbers on removable hand painted wooden planks was replaced with boring white Arial font on a black background. As I had mentioned in class, I don’t think technology and streamlining the display of objects is necessarily the right move for all Museums. Careful attention needs to be paid to the visitor experience. Some mediums don’t necessarily benefit from a minimalist and/or technological approach. After Monday’s lecture on technology within the museum, I saw this on a walk and it made me stop and think about the simplicity I seek within museum walls. Everyday I walk (as I know everyone else in the class does too) past the light store- Filaments. 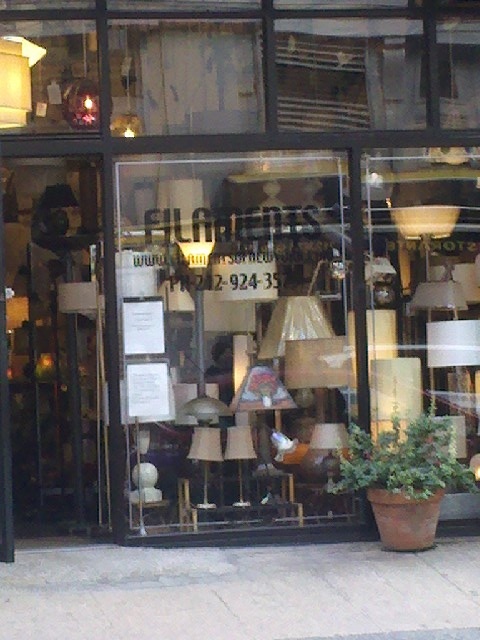 The store, located near Parson’s on 13th Street, is filled to capacity with light bulbs, stands, and shades. I know this is a stretch, but every time I walk past the store, I always think of the Hall of Biodiversity located in the American Museum of Natural History. The Hall of Biodiversity is laid out in a similar manner, it is crowded, colorful, and completely attention-grabbing. There is a very small presence of technology, making the visitor rely almost solely on the presentation of the plants and animals. If I said I adored this area of the museum, it would be an understatement. Every visit I am pleasantly overwhelmed by the information and models presented, and I always learn something new. I really appreciate the simplicity of this Hall, and I find it refreshing that I find myself thinking of the museum when I see things as simple as a store front. This is something museums must strive for- a seamless transition between spaces. Museum learning cannot stop once a visitor leaves the confines of the institution. I applaud the Hall for it’s simplicity. If it was only technological displays, instead of the appropriate combination that it does have, I doubt it would make as strong as impact on its viewers. 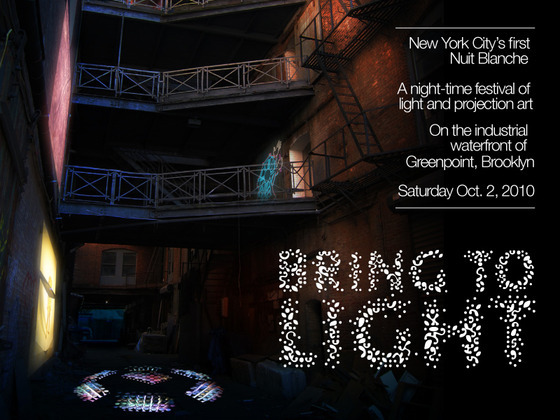 Last night in the Greenpoint area of Brooklyn, the first ever Nuit Blanche “White Night” was held in New York City. This festival of lights, which has been held in areas around the world such as Atlanta, GA and Paris, France, allows artists and designers to display their light creations on sides of buildings, in warehouses, and throughout sidewalks, playgrounds, and street corners. The festival combined artistic expression with technological outputs and showed the potential creativity that could be reached with the blending of the two. The most interesting (and relevant to our class) option they had at the event was a participatory project. Visitors to the celebration could download an application, similar to most museum styles we see today, and create their own designs that would then be projected onto the buildings. It was a great way to allow the visitor to feel creative, important, and instrumental in the success of Nuit Blanche. The picture below shows the steps required for participation. It was a great event, and an even better way to get people involved in both art and the community! An interesting aspect of the changing face of the museum is the re-purposing of spaces outside of the museum to increase visitor interest. In particular, I’m thinking of a really unique permanent installation in one of Munich’s subway stations on the U2 line. 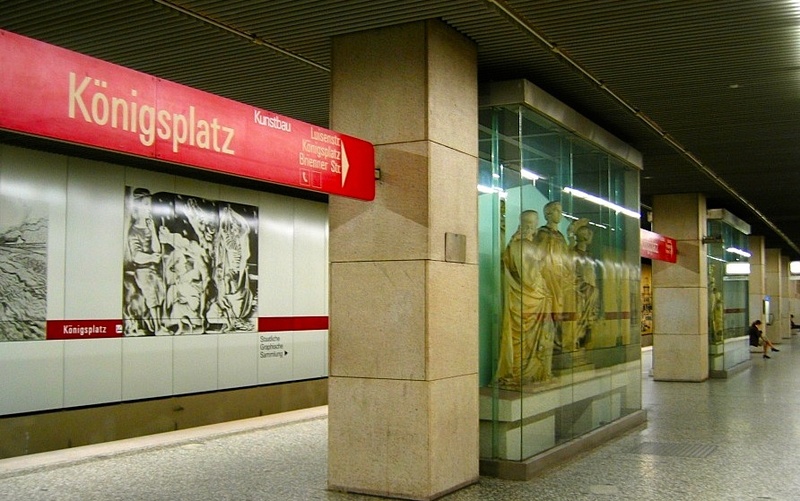 The Königsplatz station is located in the Kunstareal (museum quarter) of the city and situated directly in the vicinity of two of the world’s most important antiquity collections, the Glyptothek and Antikensammlung. The installation within the station includes large-scale glass vitrines which display selected Greek and Roman sculptures in the round, all chosen from the two museums’ collections. These displays serve as a sort of tantalizing appetizer to the incredible museums which lie directly above ground. I had the privilege of walking through and using this station every day for a year while attending university classes. At the time, my reaction was somewhat nonchalant. (Munich is famous for its innovative and dazzling subway station designs. For example, the newly renovated Münchener Freiheit station which incorporates displays of contemporary art work into its walls.) But in comparison to many a dingy and dilapidated subway station in Philly and New York, the uniqueness of Königsplatz is really something noticeable. It is at once an advertisement for the Kunstareal museums, an entertainment piece for commuters, and an integral part of the fabric of the station’s architecture. In the same vein, this subway station also hosts the Kunstbau, which is an art gallery suspended underground and above the subway station itself. 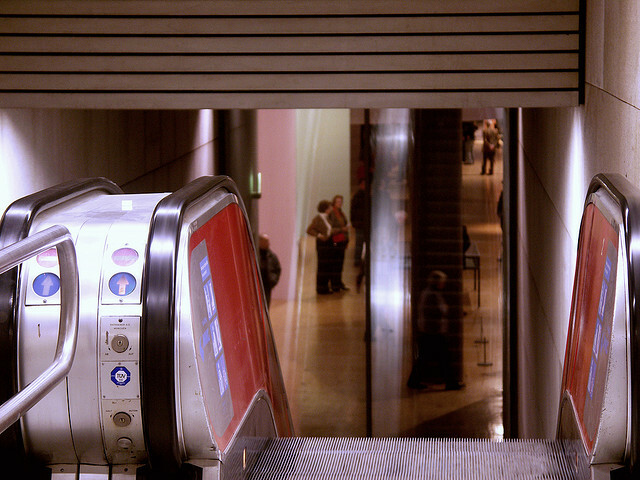 Train riders can see into the gallery as they descend the escalators to the platform, providing another sort of “real time” advertisement for the gallery’s current exhibition. Associated with the Lenbachhaus Gallery, it was designed by Uwe Kiessler, built in 1994, and is also equipped with auditorium facilities for films and presentations. A huge 2009 exhibition of Wassily Kandinsky’s work was especially successful for the gallery, and often the clear glass windows revealed an absolutely packed gallery floor to the subway passers by. These clever incorporations of museum collections into the everyday world can make even the numbing mundanity of a subway ride both a learning and cultural experience. Not to mention, they are quite successful ways to pique a prospective visitor’s interest. For more on the Kunstbau.